Chavez: Smiles, handshakes don’t change view of ‘imperialist’ U.S.
Venezuelan President Hugo Chavez said Friday he appreciated U.S. President Barack Obama’s friendly gestures at last weekend’s Summit of the Americas, but said they don’t change his view of the United States as an imperialist nation. Chavez’s fiery diatribes against the United States have included referring to former President George W. Bush as the devil. He was photographed with Obama at least twice at the summit — once when Obama shook hands with him and other leaders, and again when he approached Obama to give him a book. “The hand[shake], yes. And the smile, yes — one time and a second time and a third time and a fourth time,” Chavez said during a televised address. “But nobody should be mistaken. The empire is there, alive and kicking.” The book Chavez presented to Obama as cameras rolled is titled “Open Veins of Latin America: Five Centuries of the Pillage of a Continent.” The book chronicles Europe’s and the United States’ role in “the effects and causes of capitalist underdevelopment in Latin America,” according to one reviewer. 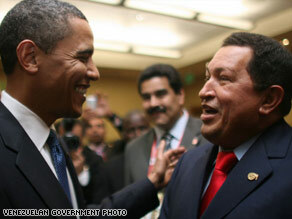 As he has in the past, Chavez noted Obama’s historic role as the first black U.S. president. “I hope Obama, for the dignity of his race, may be the last president of an imperialist United States,” he said.